Highway US-81 in northern Kansas and southern Nebraska is normally a pleasant, sleepy sort of drive. It was upgraded to a 4-lane road not too long ago, but as far as 4-lane roads go, its traffic is typically light. For drives from Kansas to South Dakota, it makes a pleasant route. Yesterday was eclipse day. I strongly suspect that highway 81 had more traffic that day than it ever has before, or ever will again. For nearly the entire 3-hour drive to Geneva, NE, it was packed — though mostly still moving at a good speed. And for our entire drive back, highway 81 and every other southbound road we used was so full it felt like rush hour in Dallas. (Well, not quite. Traffic was still moving.) I believe scenes like this were played out across the continent. I’ve been taking a lot of photos, and writing about our new baby Martha lately. Now it’s time to write a bit about some more adventures with Jacob and Oliver – they’re now in third and fifth grades in school. We had been planning to fly, and airports I called were either full, or were planning to park planes in the grass, or even shut down some runways to use for parking. The airport in the little town of Beatrice, NE (which I had visited twice before) was even going to have a temporary FAA control tower. At the last minute, due to some storm activity near home at departure time, we unloaded the plane and drove instead. The atmosphere at the fairgrounds in Geneva was festive. 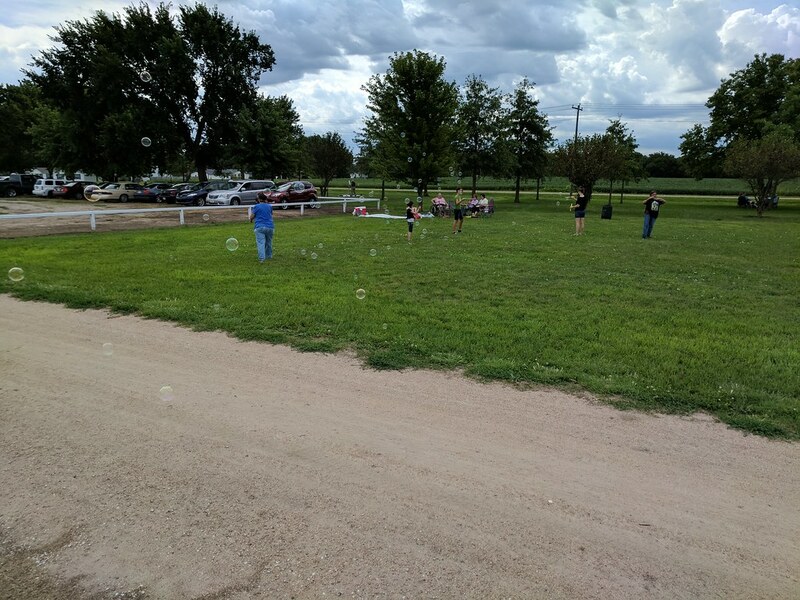 One family had brought bubbles for their kids — and extras to share. I had bought the boys a book about the eclipse, which they were reading before and during the event. They were both great, safe users of their eclipse glasses. Jacob caught a toad, and played with it for awhile. 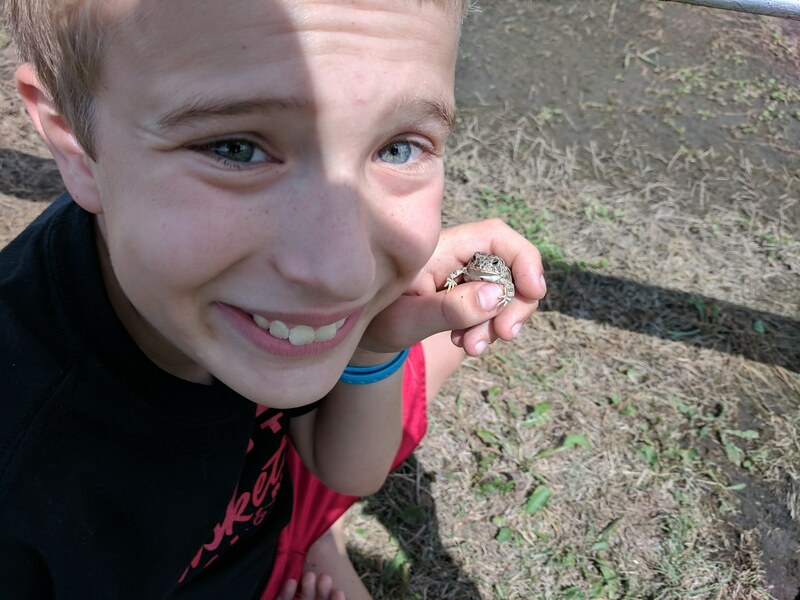 He wanted to bring it home with us, but I convinced him to let me take a picture of him with his toad friend instead. 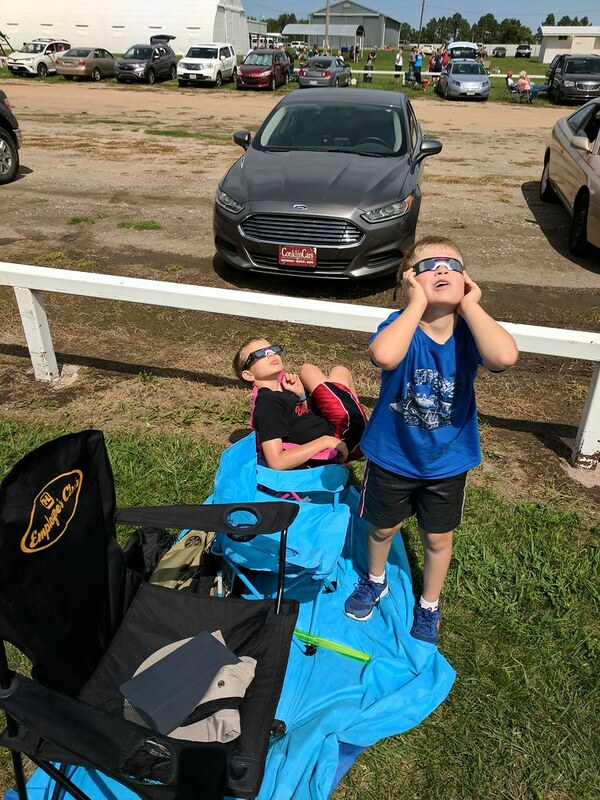 We enjoyed our “eclipse neighbors” – the woman from San Antonio next to us, the surprise discovery of another family from just a few miles from us parked two cars down, even running into relatives at a restaurant on the way home. The applause from all around when it started – and when it ended. And the feeling, which is hard to describe, of awe and amazement at the wonders of our world and our universe. There are many problems with the world right now, but somehow there’s something right about people coming together from all over to enjoy it.